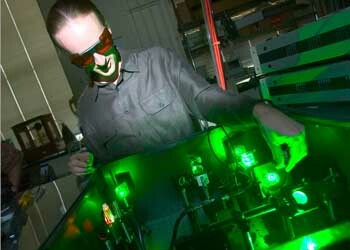 Matthew Pelton, a research fellow in the James Franck Institute at the University, adjusts a green laser used to monitor the sporadic blinking of quantum dots. Scientists at the University have discovered a better way to measure a confounding property of microscopic high-tech particles called quantum dots. Quantum dots, also called nanocrystals, emit light in a rainbow of colors and are used in lasers, biological studies and other applications, but their tendency to blink hinders their technological value—imagine the annoyance caused by a randomly flickering light bulb. Pelton has found a faster and simpler way to measure the blinking than the conventional method. He described the measurements in the Monday, Aug. 2 issue of Applied Physics Letters with co-authors David Grier, now of New York University, and Philippe Guyot-Sionnest, Professor in Chemistry, Physics and the College. 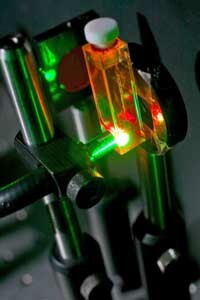 A green laser excites the quantum dots suspended in fluid (the bright spot inside the vial). Lasers as well as other light sources can now be used to study the blinking behavior of large numbers of quantum dots. Grier compares the light output or “noise” of a blinking group of quantum dots to the babble of cocktail party conversations. “Even if everyone’s talking about the same thing, you probably wouldn’t be able to figure out what they’re saying because they’re all starting their conversations at random times, and there are different variations on their conversations,” he said. In previous studies, various research groups combined powerful microscopes with video cameras to record the blinking behavior of one quantum dot at a time, but that method is expensive, time-consuming and difficult to perform. It also required that the dots be placed on a microscope slide. Pelton’s method enables scientists to study the blinking patterns of large quantities of dots. And it can be done in just a few minutes with standard laboratory equipment under a variety of environmental conditions. “Matt’s approach is applicable to situations where previous measurements could not be made,” Guyot-Sionnest said. 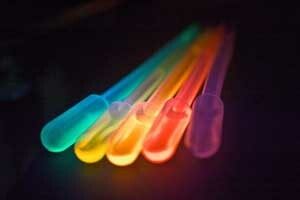 Individual quantum dots are too small to be seen with the naked eye, but they signal their presence by emitting light in a variety of colors. The quantum dots shown here, which are suspended in fluid inside laboratory plasticware, emit different colors depending on their size. The four components of Pelton’s system are a light source, a photodetector (a device that measures the intensity of light), an amplifier to boost the photodetector’s output, and an analogue-to-digital converter that translates the amplified output into a string of numbers for digital processing. The system already has revealed new insights into the behavior of quantum dots. Pelton’s results contradict the conventional wisdom that environmental factors influence the behavior of the blinking dots. Pelton made his finding by applying a mathematical tool commonly used by electrical engineers to the problem of blinking quantum dots. “The mathematical tool is almost 200 years old. No one had thought to apply it to this problem before,” Grier said. Studying quantum dots one at a time with microscopes and video cameras has its limitations. For example, a camera that takes 40 frames per second will miss the more rapidly occurring blinks. But Pelton’s system includes a power spectrum, a tool used to trace blinking behavior, and which has established numerical recipes for handling the time resolution problem. The research team cannot predict how long it might take to crack the mystery of the blinking quantum dots, though it is certain that quantum dots will continue to generate interest in high-tech circles. “Many scientists are trying to start up companies to make nanocrystals and to find a new use for them,” Guyot-Sionnest said. The University’s Materials Science and Engineering Research Center, the National Science Foundation, and the American Chemical Society supports quantum dot research at Chicago.